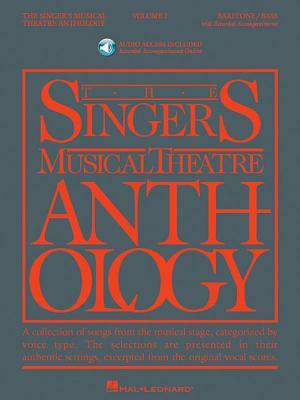 The Singer's Musical Theatre Anthology: Baritone/Bass, Volume 1 [With 2 CDs] (Paperback) | The Drama Book Shop, Inc.
(Vocal Collection). The world's most trusted source for great theatre literature for singing actors. The book includes access to online recordings of piano accompaniments. The book features authentic editions of each song in the original keys. The songs have been carefully chosen for each voice type and are culled from a wide selection of classic and contemporary shows. Contents: ANYONE CAN WHISTLE: Everybody Says Don't * BIG RIVER: River in the Rain * CAMELOT: Camelot, C'est Moi, How to Handle a Woman, If Ever I Would Leave You * CAROUSEL: If I Loved You, Soliloquy * CINDERELLA: Ten Minutes Ago, Do I Love You Because You're Beautiful? * COMPANY: Marry Me a Little, Sorry-Grateful * THE FANTASTICKS: Try to Remember * FOLLIES: The Road You Didn't Take * HMS PINAFORE: When I Was a Lad * IOLANTHE: When You're Lying Awake * KISS ME, KATE: Were Thine That Special Face, Where Is the Life that Late I Led? * KNICKERBOCKER HOLIDAY: September Song * LOST IN THE STARS: Lost in the Stars, Thousands of Miles * LOVE LIFE: This Is the Life * MAN OF LA MANCHA: Dulcinea, The Impossible Dream, The Man of La Mancha (I, Don Quixote) * THE MUSIC MAN: Marian the Librarian * OKLAHOMA : Lonely Room, Oh, What a Beautiful Mornin' * OLIVER : Reviewing the Situation * PAINT YOUR WAGON: They Call the Wind Maria * THE PIRATES OF PENZANCE: I Am the Very Model * PORGY AND BESS: I Got Plenty O' Nuttin' * SHENANDOAH: I've Heard It All Before, Meditation I, Meditation II * SHOW BOAT: Ol' Man River * SOUTH PACIFIC: Some Enchanted Evening, This Nearly Was Mine * THE THREEPENNY OPERA: Mack the Knife.